I started the UK WFB Tournament Rankings for this year in 945th place, I have now risen to 712th after placing 21st at the Gobstyks event. Thats a jump of 233 places in the first two months! I have still to achieve my new year resolution target of top 250, but I have made a good start in getting there. Unfortunately my next tournament Winter Incursion being held at Maelstrom Games will not be included in the rankings, this is the decision that Maelstrom Games have taken. Here is my tournament record so far….. The rankings have recently been moved to a new website Rankings HQ. Its a brilliant web site containing rankings for WFB and 40K from all over the world. 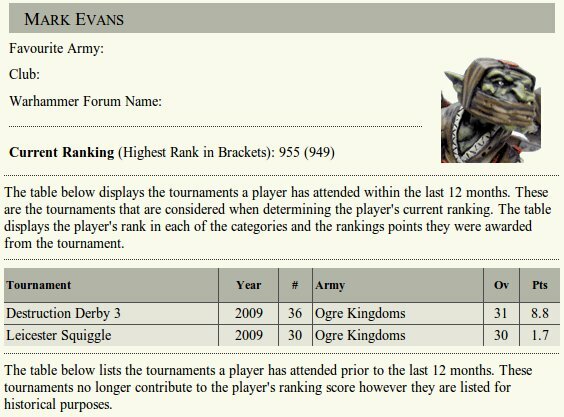 Well after my first three tournaments I finished the 2009 UK Warhammer Fantasy Battle Rankings with a ranking of 955th. Unfortunately the Immortal War result has not been included, which won’t really improve my ranking anyway. A lot more tournaments next year, and I will be improving on this! 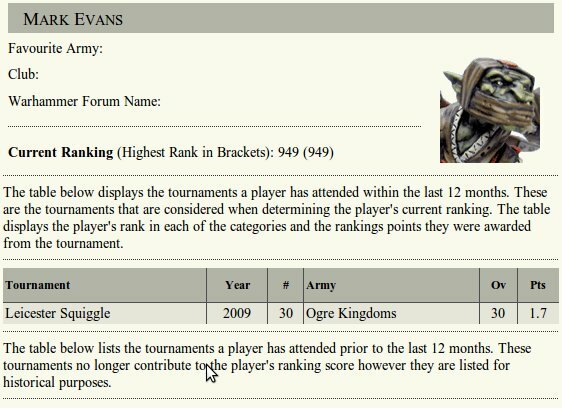 I am now on the UK Warhammer Fantasy Battles Rankings! With a starting ranking of 949th. Its not earth shattering, but its a start!